In the last third of the 16th century, the Spanish crown set in motion a project to obtain a complete map of the New World. The method thought up for this was to use surveys, known as Relaciones Geográficas. A questionnaire with more than 50 questions was sent to each settlement. These also had to be completed with a map of the local region. These maps, known as pinturas (paintings), mainly lacked ground measurements and therefore scale, as well as geographical coordinates. Only a few were done following the norms of European mapmaking. Among these, some of the most important are the maps created by the Sevillian Francisco Gali, navigator, explorer, cosmographer and cartographer. 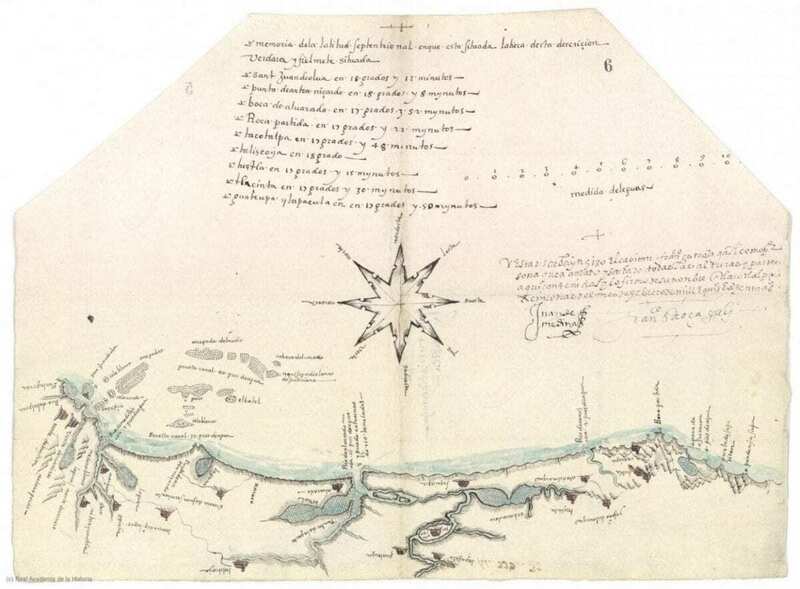 In this context, Manuel Morato, researcher from the Higher Technical School of Engineering (ETSI) of the University of Seville, has published a scientific article on the map of Tlacotalpa, one of the first examples of local nautical cartography in Hispanic America, which Francisco Gali did on behalf of some mayors who had to complete the Relaciones questionnaire, as ordered by Philip II. Tlacotalpa, today Tlacotalpán, is a small river village in the southeast of the state of Veracruz, within the limits of the Papaloapan region, in Mexico. “These local civil servants, instead of getting a local artist to draw the maps, made the most of the fact that Gali, a sailor with knowledge of cartography, was travelling through the area towards the Pacific coast in an attempt, on the orders of the King, to find a route to the Philippines from the west coast of Mexico”, explains Morato. It is a hand-drawn nautical chart from February 1580, done with great exactness for the standards of the time. It shows in great detail the coast, the estuaries, bays, capes, lagoons and rivers, and in some areas indicates the depth of the water. Both the chart and the text of the Relación are kept in the Royal Academy of History in Madrid. According to the text of the Relación, in the local tongue náhuatl-Tlacotalpa means divided land, which refers to the fact that the village was founded in the Pre-Hispanic era on an island in the river Papaloapan, as is represented on the map. “The Gali map has been compared with current satellite photographs and the images are practically the same, apart from the distances of the time and the growth of the populated areas, like the city port of Veracruz and its surroundings”, adds the researcher. So, the planimetric deformation of the map, compared with a current one, could be due to the fact that, the article postulates, that Gali did not take sufficient measurements or that he did so but too quickly, as he was only passing through the area. North American experts like Barbara Mundy suggest that these deformations could be due to Gali having used an existing padrón (a master map that was updated as new lands were discovered), which already included these deformations, leaving the author of the map only having to complete the information by adding places and detailing geographical features. Manuel Morato maintains that this hypothesis is quite unlikely due to the secret nature of the Padrón Real, which was jealously guarded in the Casa de la Contratación in Seville and of which obsolete copies were destroyed so that they did not fall into the hands of foreign powers. Other causes could have been motivated by the lack of in situ measurements and by the impossibility to determine geographical length in the 16th century. Francisco Gali is known worldwide for his Trans-Pacific voyages, but little or nothing is known about him before his appearance in America. He discovered the Acapulco route to Manila in 1583 and, according to the data kept in the Archivo General de Indias in Seville. He explored the islands of the archipelago of Hawaii, the coast of California and San Francisco Bay, which he was the first explorer to see, though he did not cross it, for which reason its discovery has historically been attributed to Gaspar de Pórtola in 1769 and to Juan de Ayala, who was the first to cross the bay in his schooner on the 5th of August 1775. In 1585, this Sevillian navigator wrote the book, ‘Voyage, discoveries and observations from Acapulco to the Philippines, from the Philippines to Macao and from Macao to Acapulco’. The manuscript was sent to the Viceroy of Mexico, but for unknown reasons, ended up in the hands of the Dutchman Jan Huygen van Linschoten (1563-1611), who published it in Dutch as ‘Defeat of the Indies’ (Amsterdam, 1596, 1614, 1626). It was also translated into English (London, 1598), to German in the same year, into Latin (The Hague, 1599) and into French (Amsterdam, 1610, 1619 y 1638). It was, however, never published in Spanish. In addition, the whereabouts of Gali’s original remain unknown, another of the mysteries that surround the life of this man. Gali worked as a cartographer on three Relaciones Geográficas: Tlacotalpa (February 1580), Coatzacoalcos (April 1580) and Tehuantepec (September-October 1580). The first two maps are signed by their author, while the Tehuantepec map is anonymous, “although it has an unmistakable similarity to the other two maps by Gali. However, this map is not given much credit as it is incomplete, it is clear that it wasn’t made using the same measuring techniques as Gali used on his other two Gulf maps”, explains Manuel Morato. Morato, together with experts from the School of Hispanic American Studies (EEHA) at CSIC (Council of Scientific Research), has been working on the study of the representation of the territory from a historical perspective since 2010, using 16th-century maps, especially those related to the discovery and colonisation of the Americas. To help with this project, he has had the help of Carmen Maso, head of cartography and graphic arts at the Library of the Royal Academy of History in Madrid, and of Michael Hironymous, head of rare books and manuscripts at the library of the University of Texas in Austin. “Much of our work has also been carried out in the Archivo de Indias in Seville, which is an endless source of freely accessible knowledge, which is there for all but sometimes seems undervalued”, says the University of Seville researcher.